She does not work alone… This beautiful album is the magical fusion with Andrés Beeuwsaert. 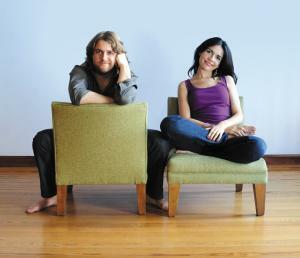 The duo of Sao Paulo-born singer and composer Tatiana Parra and pianist, composer and arranger Andrés Beeuwsaert was formed in August 2008. During her career, Parra has performed with Brazilian musicians such as Ivan Lins, Rita Lee, Gilberto Gil, César Camargo Mariano and André Mehmari; while Beeuwsaert has mainly played with the trio Aca Seca (with guitarist Juan Quintero and percussionist Mariano Cantero). These two thirty-something musicians met at the Aca Seca’s concerts in Brazil, where Parra was a guest musician. Their first recordings together appear on Dos ríos, an album released by Beeuwsaert in 2009, and Parra’s Inteira from 2010. The duo plays a vast repertoire of Brazilian and Argentine music including pieces by Carlos Aguirre, Edu Lobo, Pixinguinha, Lea Freire and Dori Caymmi, and also their own original compositions. During 2010, the duo began to perform in diverse cities of Latin America and Europe. Next year, they will join Europália, a project that gathers Brazilian and Belgian musicians. Aquí (Borandá) is the band’s first album, released this year, where the vocals are on an equal footing with the instrumentation. Some songs feature vocals by Ivan Lins.